Neither Bob nor I had visited the Grand Canyon before when we arrived there a few weeks ago. Our first impression was that the Park was darn busy and full of people. Road signs as you head toward the South Rim warn about traffic jams at the Park entrance. Luckily our wait in line was not too bad, with just six cars in front of us. But with ten lines of six cars waiting to get in at the same time as us, you can imagine how busy the Park must get in the course of a day. In 2013, 4.6 million people entered the Park, which translates to some 12,500 people per day. No wonder the Rim Trail was crowded at times. It was also Spring Break time, explaining much of the crowd (there were lots of kids), and also explaining the beautiful spring weather. It was in the 30s when we got up and when we went to bed, but at least in the 70s by mid-day. Canyon views were a little hazy—the rangers blame air pollution, both manmade and from forest fires—but we couldn’t have asked for more beautiful weather. The first day we were there, we walked the Rim Trail eastward and explored the historic El Tovar Hotel. Beauty all around. 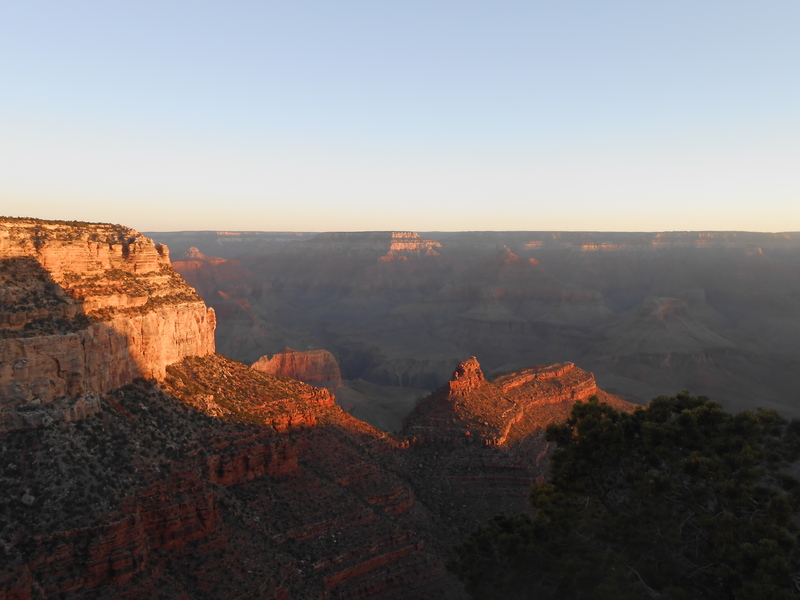 Having been told that we absolutely must watch both a sunrise and a sunset over the Canyon, we ended our day (or at least the outdoors part of it) at the rim, watching the scenery change every few minutes as the sun moved. Lovely. And, we met a family from Indianapolis whose two sons attend IU. Even at the Grand Canyon, it’s a small world! 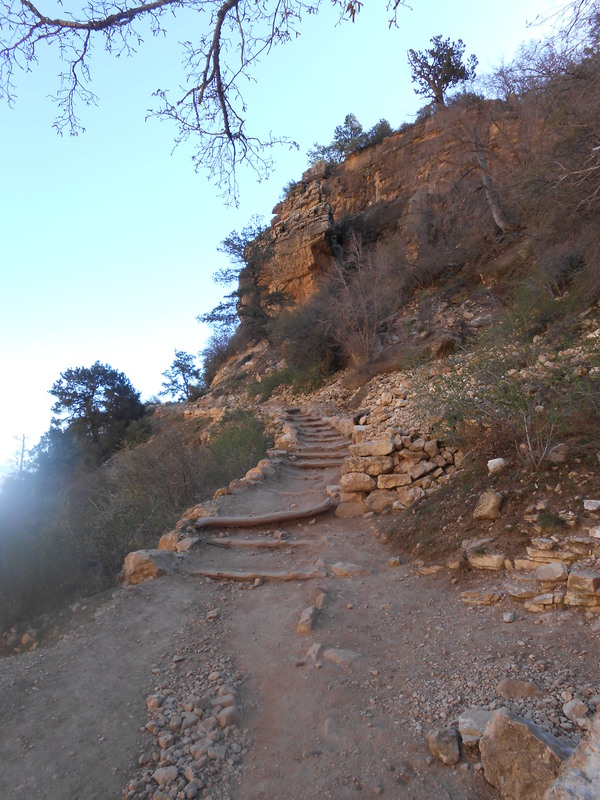 The next day after a Grand Canyon sized breakfast to give us strength, we headed down the Bright Angel Trail into the canyon. Our goal was to make it to the first “rest stop,” 1.5 miles away but only 1,100 feet down (out of the total 6,000). Lots of switchbacks! We did make it there and back, enjoying some of the best views of the trip from below the rim. Being below the rim was a bit disconcerting, as you look up at the huge rocks above. Nature has been working on the Canyon for two billion years, so what’s to keep her from picking the day you’re underneath one of those big cracked rocks to drop one down on you! The next morning we got up in time to watch the 6:30 am sunrise, which afforded more lovely views. Tempted by the ever-changing views provided by the movement of the sun, we walked west on the Rim Trail and discovered more amazing vistas of the Canyon and we were very tempted to keep walking, though we had to leave for Sedona. That’s okay—it’s the knowledge that there is much more to see that will perhaps get us back to the Grand Canyon someday. 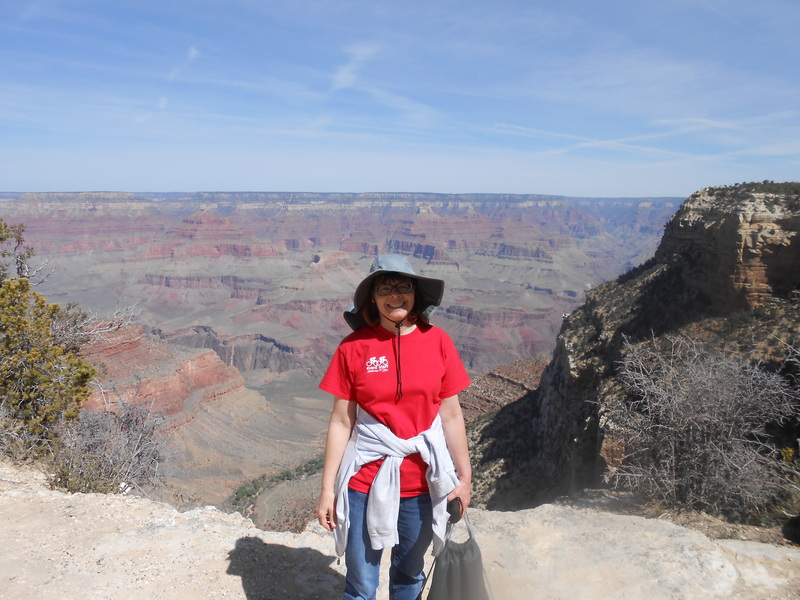 More Grand Canyon photos are found on my Facebook community page, Out of Work Editor. Previous Article Previous Article: Test Drive a Classic Mustang Cobra—Done!